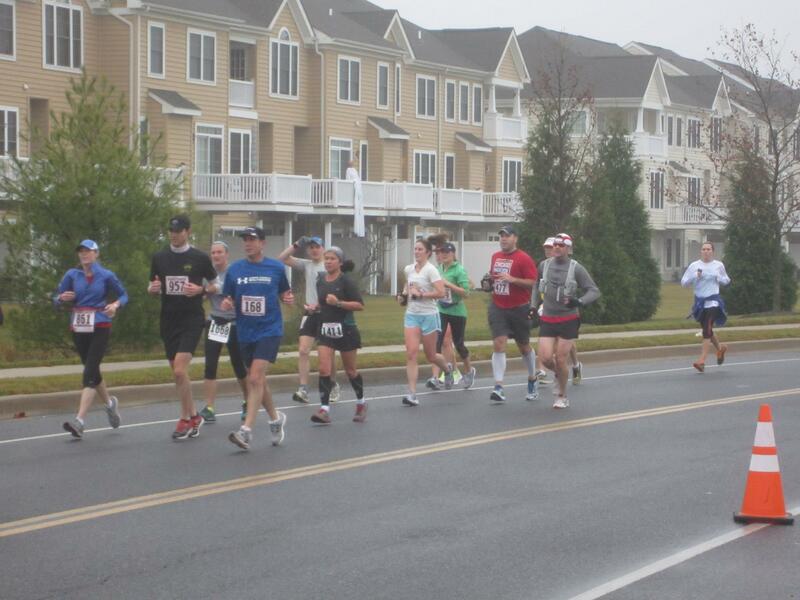 The Rehoboth Beach Marathon was my fifth marathon, done a little over 8 months after becoming a new mom. I hadn’t actually considered doing a marathon this year. I thought a half would be an ‘appropriate’ running gift to myself after Connor was born. 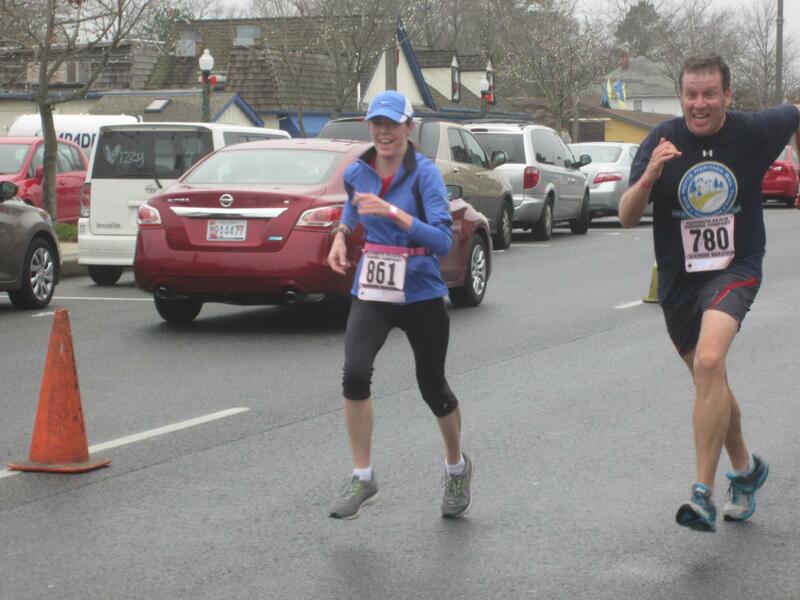 But then my marathoning friend, Joe, mentioned Rehoboth and all of a sudden, I had to do it. 11 weeks out I started training as best I could, juggling new mom duties and a heavy workload. My original goal was just to finish. But of course, my competitive, stubborn side set in and despite ‘training to finish,’ a week or so before race day I got my heart set on sticking with Joe’s pace group to finish under four hours. For the first time ever, I tracked every day of the week leading up to the race. The night before, we met up with Joe and his crew of runners and family for a 6pm dinner. Very good call eating early. I had one delicious Dogfish Head beer and pulled pork tacos at the Pig & Fish. I was very excited to have my husband and son with me for the weekend and we enjoyed seeing Rehoboth off season as we walked back to the hotel. I was in bed by 9pm with my gear laid out and morning coffee ready to go. We were staying at the Atlantic Sands Hotel (recommend it! ), just a few hundred yards from the start line. We got extremely lucky with weather. 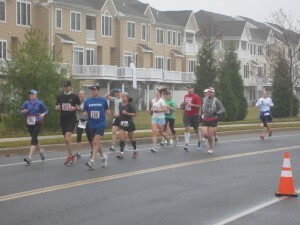 It was hazy and overcast at the start and stayed overcast all day. Just a light breeze and it was around 40 degrees at the start. 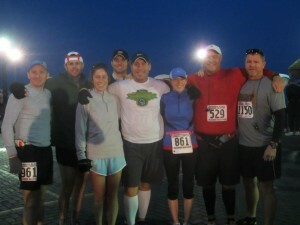 Our group met to walk over to the start around 6:45 and the race started only a couple minutes lat at 7:07. Joe had extremely experienced and ultra runners as his pace group and I was planning to keep up with them as best I could. All my long runs were around a 9:40 pace and making a late decision to try and run closer to 9:00 was a big gamble. We started out a little fast, around 8:54. But it felt so good! We talked. I hardly run with others let alone talk so I was pleasantly surprised at how chatty I was and definitely enjoyed running with a pack. For the first 7 miles or so we were spot on pace. By mile 11 we had spaced out a bit and when I finally had to hit the porta-pot I was by myself, still trying to stay around a 9 minute pace. I thought about the Lower Potomac River Marathon where I was happily trotting along at a fast pace barely noticing the first half. This race was not like that. I was thinking a lot about whether or not I could sustain the pace. I had also forgotten my Clif ShotBloks in my rushed packing so I was also thinking about getting the Gu Chomps at the first opportunity. I had a packet of Chomps at mile 10 (I think), another packet at mile 17-ish and a Gu gel at mile 20-ish. I was pleasantly surprised that my stomach was very kind to me on race day. Again, I credit an early dinner. I felt myself starting to slow by mile 17 and I was really questioning if I could run sub-4. One of Joe’s running buddies had said early on that the race is two parts: the first 20 and the last 10k. Reevaluate at 20. So I had it in my head that I’d see how I felt at 20. If I could pick the pace back up I would but if not, I’d reevaluate again at 23 and see what I had left in me. With my pace waning, my feet hurt, my lower back hurt, my hamstrings hurt, by mile 23 I was just about resigned to stay slow and steady and stick with my original goal of just finishing. But then, my husband appeared on the trail with our son in the Baby Bjorn and he gave me the kick I needed. He told me if I pushed hard I could still finish under 4. And that was all I needed. I ran my heart out. I pushed and watched my pace come back to around 8:30 and my mind kept switching between determination and doubt. I pushed when I could and scaled back when I needed to knowing we were so close to the finish. With less than a mile to go I knew I would be right on the 4 hour edge. I was running hard and digging deep. When my watch hit 26.2, I was at 4 hours on the dot. And I was not at the finish line. As I’ve learned before, if you don’t run the exact line of the course, you will inevitably run more. So with the finish line in sight, I was coming up on a fellow runner and heard someone on the side lines make a fun commeij,hb nt about a girl passing a guy. And that was the next kick I needed. I sprinted. He sprinted. I passed him and crossed the finish in 4:02:47. 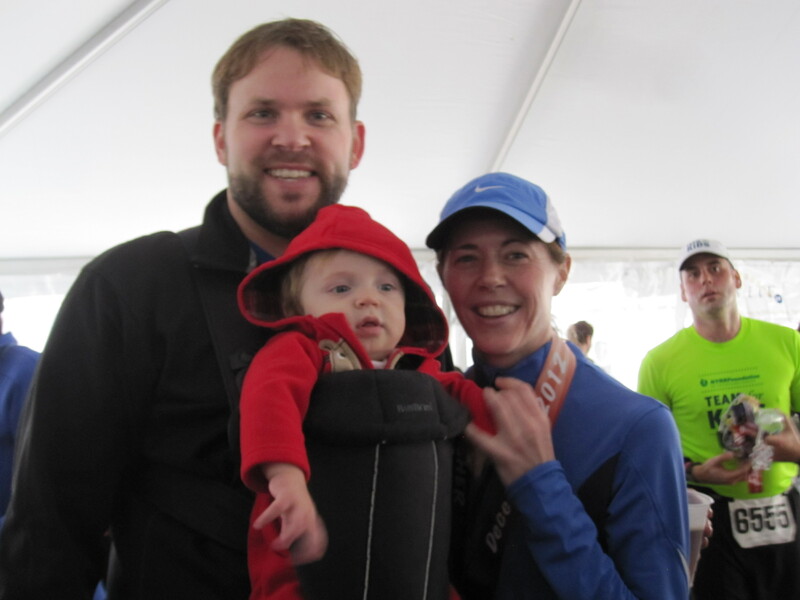 This entry was posted in Running on December 12, 2012 by Natalie.